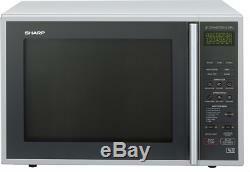 Sharp Combination Microwave, 40 Litre, 900 Watt, Silver. Silver finish with stainless trim. Convection oven temperature max 250°C. 5 power controls, 8 auto cook menus. Sharp combination microwave oven offers you a multitude of different cooking options, cleverly combining the benefits of microwave, grill and convection oven. You can bake, roast or grill just as you would with a conventional oven, only faster. With upto 40 litre capacity, it's certainly large enough to cater for any occasion. The Sharp R959SLMAA microwave oven allows you to cook on both shelves simultaneously. The reason for this is the conventional cooking function works in the same way as a standard convection oven. The results are that the Sharp R959SLMAA is perfect for those who like to bake in batches. As the Sharp microwave oven features a quartz grill it ensures that the food heats up fast, is easy to clean and safe to use and leaves more space in the cavity for cooking and ultimately gives fantastic grilling results. Enjoy a host of further advanced features including express cook and express defrost plus a double grill function that's perfect for crisp pizzas straight from frozen. 1x Sharp 40L Silver Combination Microwave & Instruction Manual. ALL ITEMS SENT DIRECTLY FROM APPROVED 3rd PARTY SUPPLIERS. These items may be dispatched directly to you from a third party distributor. You must have a confirmed address. This allows our products to remain very competitively priced. Please note, bundled items may arrive separately and on different days because we may use different suppliers. We may also re-use packaging when appropriate as an attempt to reduce our overall environmental impact on the planet. Please note that any pre-existing damage of the received item/s MUST be communicated within 24 hours after the item has been received; failure to do so may result in us (on our supplier's behalf) not granting you the return. When returning an item, it must be in all of the original packaging and include all of the original accessories or items that came with it. The item and package should be in original and perfect condition. We do our best to process as quickly as possible. We request you to try your new item/s as soon as you receive them. If the item in your opinion doesn't correspond to pictures and/or descriptions, you MUST inform us within 24 hours after the item has been received; failure to do so may result in us (on our supplier's behalf) not granting you the return. If you changed your mind about the item, but nothing is wrong with the item itself e. It works properly and perfectly corresponds to pictures and descriptions, we (on our supplier's behalf) may not grant you the return. The item "Sharp Combination Microwave, 40 Litre, 900 Watt, Silver" is in sale since Sunday, September 03, 2017. This item is in the category "Home, Furniture & DIY\Appliances\Small Kitchen Appliances\Microwaves". The seller is "*microwave-kettle-toaster-sets*" and is located in London. This item can be shipped to United Kingdom.